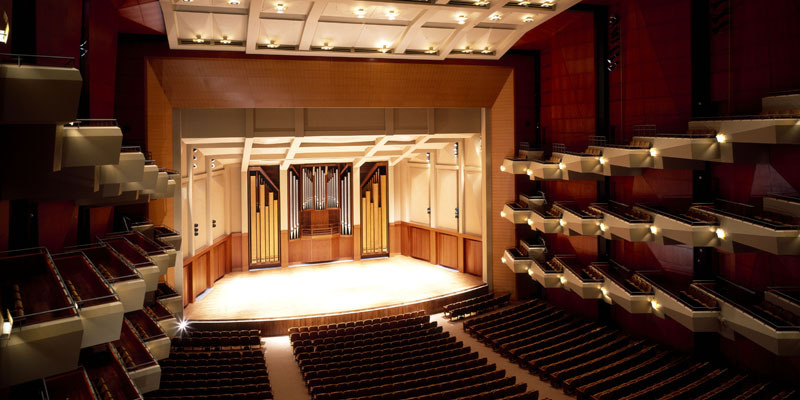 Quite possibly the last great concert hall to be built world-wide in this century, Seattle’s Benaroya Hall has been acclaimed internationally for its incredible acoustic properties and the magnificence of its interior woodwork. All 32,750 sq. 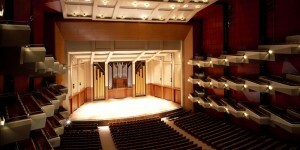 ft. of wood veneer for 3,659 panels in the main auditorium came from just one Makore tree – a rich brown, figured wood. O.B. Williams Company of Seattle manufactured these panels which are acoustically and architecturally designed in a variety of shapes, sizes and angles. Every component of this remarkable panel system was computer designed by Williams working closely with project architects Loschky, Marquardt and Nesholm, Seattle, and famed acoustic consultant Dr. Cyril Harris of New York. Additionally, the company produced 1,541 panels – some of these with Anigre veneer, others with elegant Bird’s Eye Maple veneer. 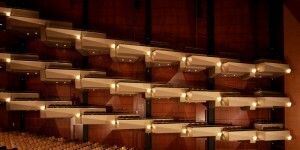 Altogether, the Benaroya Hall project called for Williams to manufacture a grand total of 5,200 panels. Those designated for the main hall were acoustically insulated and installed with 29,000 exposed black oxide-finished stainless steel screws attached to wood furring on a pre-cast substrate to prevent panel vibration. The installation tolerances specified by the architects were so tight that project general contractor Baugh Construction, Seattle, told the architects that they were nigh impossible to achieve. John Hayduk, Baugh vice-president, said O.B. Williams was able to meet the tolerance requirements and he commended the company for a ‘truly marvelous piece of craftsmanship’. David Wick, O.B. Williams’ vice-president, stated that all panel material was constructed to Class-A fire retardant specifications and installed on fire-treated backing. Other manufacturing highlights include the production of intricate curved and vaulted panels for the ceiling and proscenium. The breadth of the hall’s proscenium is 69 ft. by 45 ft. in height. Proscenium border paneling is 9 ft. 6 inches wide. The project also included the cladding of metal acoustic-rated doors with wood veneer to match the hall paneling system. Sizing and machining for the entire project was done at O.B. Williams Seattle plant using highly advanced computer-controlled equipment. A complete contract package incorporated engineering, drawings, material selection, fabrication, finishing and installation.